Noor al-Huda School was established in 2014 with the purpose of fulfilling the educational needs of our young children, catering for those at nursery, reception and year 1. Our aim is to give our students a good foundation in the Arabic language and in Islamic values and teachings. We recognise that our teachers have a very strong influence on the children at this very young and impressionable age, and we take this responsibility very seriously. As such, we are dedicated to instilling them with key Islamic values such as honesty, tolerance and compassion, so that they might grow up to be well-adjusted and engaged members of society. We firmly believe that bilingualism is an indispensable tool when it comes to balancing the different cultures our children will inevitably encounter when they grow up. Fluency in both English and Arabic will give them the ability to engage completely with British society whilst at the same time connecting with their Eastern and Islamic roots. Our ultimate goal is to raise up a generation of well-rounded individuals who will be valuable assets to our community and to the pluralism of British society in general. For most, if not all, of our students Arabic will be a second language. As such, we have a special curriculum specifically designed to teach the Arabic language to non-Arabic speakers. We aim to give our children a foundation in the language that they will able to build upon in later years, teaching them the basics of the Arabic alphabet and engaging them with exercises suitable for their ages. As well as Arabic, we also have classes in Islamic Education which are all taught in English and give our students a good basic understanding of their religion. At Noor al-Huda we have a very strong emphasis on homework. The few hours of school every week are not enough for our students to get to grips with the Arabic language, and so homework is paramount. We strongly encourage all our parents to help their children with their homework and engage with their studies outside of school hours. We cannot stress enough what a difference this makes to the student’s understanding and improvement. 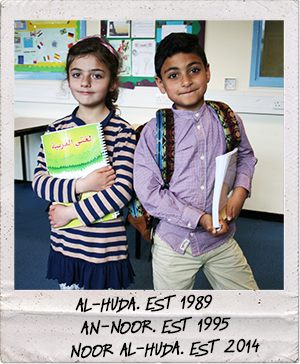 The vast majority of our students go on to continue their studies in Al-Huda or An-Noor schools, and the preparatory education they take at Noor al-Huda holds them in good stead for the years of further study ahead. At Noor al-Huda we believe that extra-curricular actives are just as important as educational activities for the development of young minds. As such, our academic year is peppered with activities designed to stimulate our students’ imaginations. We hold events celebrating and commemorating religious occasions, such as Eid, Muharram and the birth of Prophet Muhammed (s). These events often involve a variety of activities, including poetry readings, cartoons about the occasion in question and plays performed by the students. They allow the children to engage with their religion in a more dynamic and fun way than in the classroom. As well as that, we have an annual Qur’an memorisation competition to encourage our students to connect with the Holy Book. Last year over 70 students entered and 31 reached the first level, 9 of them achieving distinction. Towards the end of the academic year we hold a charity bazaar for all the students and their families, where clothes, domestic commodities, and food and drink are sold, with all the proceeds going to the orphans of Iraq. On the last day of school we have a celebration in which all the students come together to rejoice in the completion of the curriculum. Prizes are distributed to the best students of the year so that the whole school can recognise their outstanding achievement.